It is not strictly required by ISO 14971 or any other standard (unlike the Hazards Analysis) and it does not necessarily deal with the consequences on the patient or user. FMEA is a tool to ensure that you have captured all possible causes and failure modes of your system. In a top-down analysis (like the Hazards Analysis) it is difficult to identify correctly all the low level causes and sometimes, with complex systems, it is not all that practical. FMEA can bridge these issues, allowing you do identify what component can cause which failure, without making your Hazards Analysis too cumbersome, and consequently less useful. FMEA is also used in several circumstances to comply with specific requirements. For example, referencing IEC 62304, FMEA is a great way to address the potential effects of failures of software items. It is also a useful method to identify critical/key features of your product. Is there a standard template for FMEA? Not really. 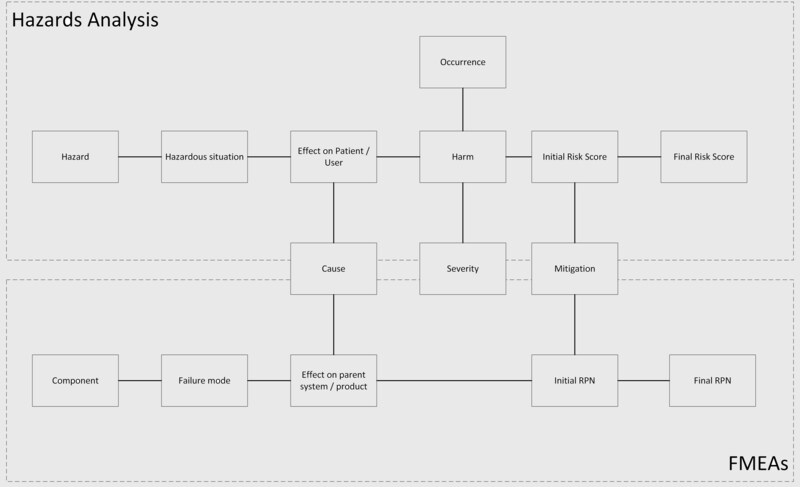 The FMEA follows the same principle of any other risk analysis tool, starting with the low level components on the left side and progressing to effects, causes, initial evaluation, risk mitigation activities and final evaluation. Severity and Occurrence are the two parameters always used to score each item, with Detection added sometimes to assess the effects of inspection or other verification activities. What is the difference between FMEA & Hazards analysis? Let’s look at the similarities and differences of the FMEA and the Hazard Analysis with the help of an example. Let’s look at a generic device, which has a casing mounted on a frame using one bolt. Remember that in the Hazard Analysis, the severity rating for a certain harm must always be the same. Similarly, the risk mitigation for the same cause-effect risk items must report the same activities and so should their verification activities. 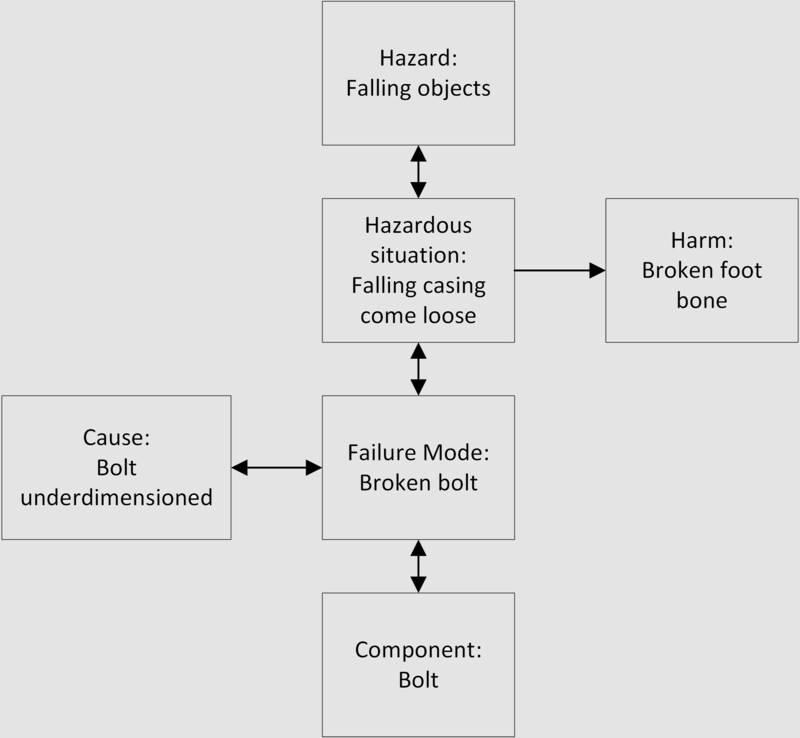 To summarize, the main link between the FMEA and the Hazard Analysis is at the Cause level: a certain failure mode has the potential to result in a hazardous situation; and the hazard related to this hazardous situation is caused by (among others) that failure mode. Quick tips for your FMEA! Like all risk management activities, remember to use it to ensure that the team feels confident in the technical solutions adopted and no major issue was missed. An average FMEA should be in the range of 100 to 300 risk items. With less than 100 and, if the system is not extremely simple, you may have missed important items. More than 300 will make it difficult to manage. 2. FMEAs can easily be nested into each other, with lower level FMEAs feeding into parent FMEAs.